It is a malignant tumor of the lung arising within the bronchial wall or epithelium. Bronchogenic cancer is classified according to cell type: epidermoid (squamous cell – most common), adenocarcinoma, small cell (oat cell) carcinoma, and large cell (undifferentiated) carcinoma. The lung is also a common site of metastasis from cancer elsewhere in the body through venous circulation or lymphatic spread. 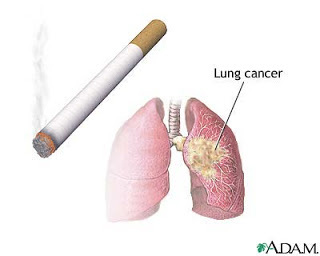 The primary predisposing factor in lung cancer is cigarette smoking. Lung cancer risk is also high in people occupationally exposed to asbestos, arsenic, chromium, nickel, iron, radioactive substances, isopropyl oil, coal tar products, and petroleum oil mists. Complications include superior vena cava syndrome, hypercalcemia (from bone metastasis), syndrome of inappropriate antidiuretic hormone (SIADH), pleural effusion, pneumonia, brain metastasis, and spinal cord compression. New or changing cough, dyspnea, wheezing, excessive sputum production, hemoptysis, chest pain (aching, poorly localized), malaise, fever, weight loss, fatigue, or anorexia. Decreased breath sounds, wheezing, and possible pleural friction rub (with pleural effusion) on examination. Chest X-ray may be suspicious for mass; CT or position emission tomography scan will be better visualize tumor. Sputum and pleural fluid samples for cytologic examination may show malignant cells. Fiberoptic bronchoscopy determines the location and extent of the tumor and may be used to obtain a biopsy specimen. Lymph node biopsy and mediastinoscopy may be ordered to establish lymphatic spread and help plan treatment. Pulmonary function test, which may be combined with a split-function perfusion scan, determines if the patient will have adequate pulmonary reserve to withstand surgical procedure. Oxygen through nasal cannula based on level of dyspnea. Enteral or total parenteral nutrition for malnourished patient who is unable or unwilling to eat. Removal of the pleural fluid (by thoracentesis or tube thoracostomy) and instillation of sclerosing agent to obliterate pleural space and fluid recurrence. Radiation therapy in combination with other methods. Resection of tumor, lobe, or lung. Expectorants and antimicrobial agents to relieve dyspnea and infection. Analgesics given regularly to maintain pain at tolerable level. Titrate dosages to achieve pain control. Chemotherapy using cisplatin in combination with a variety of other agents and immunotherapy treatments may be indicated. Elevate the head of the bed to ease the work of breathing and to prevent fluid collection in upper body (from superior vena cava syndrome). Teach breathing retraining exercises to increase diaphragmatic excursion and reduce work of breathing. Augment the patient’s ability to cough effectively by splinting the patient’s chest manually. Instruct the patient to inspire fully and cough two to three times in one breath. Provide humidifier or vaporizer to provide moisture to loosen secretions. Teach relaxation techniques to reduce anxiety associated with dyspnea. Allow the severely dyspneic patient to sleep in reclining chair. Encourage the patient to conserve energy by decreasing activities. Ensure adequate protein intake such as milk, eggs, oral nutritional supplements; and chicken, fowl, and fish if other treatments are not tolerated – to promote healing and prevent edema. Advise the patient to eat small amounts of high-calorie and high-protein foods frequently, rather than three daily meals. Suggest eating the major meal in the morning if rapid satiety is the problem. Change the diet consistency to soft or liquid if patient has esophagitis from radiation therapy. Consider alternative pain control methods, such as biofeedback and relaxation methods, to increase the patient’s sense of control. Teach the patient to use prescribed medications as needed for pain without being overly concerned about addiction. Teach the patient to recognize the signs and symptoms of infection at the incision site, including redness, warmth, swelling, and drainage. Explain the need to contact the physician immediately. Be sure the patient understands any medication prescribed, including dosage, route,action,and side effects. Provide the patient with the names,addresses,and phone numbers of support groups, such as the American Cancer Society, the National Cancer Institute, the local hospice, the Alliance for Lung Cancer Advocacy, Support & Education (ALCASE), and the Visiting Nurses Association. Teach the patient how to maximize her or his respiratory effort. Demonstrate improved ventilation and adequate oxygenation of tissues by ABGs within patient’s normal range. Note respiratory rate, depth, and ease of respirations. Observe for use of accessory muscles, pursed-lip breathing, changes in skin or mucous membrane color, pallor, cyanosis. Rationale: Respirations may be increased as a result of pain or as an initial compensatory mechanism to accommodate for loss of lung tissue; however, increased work of breathing and cyanosis may indicate increasing oxygen consumption and energy expenditures and/or reduced respiratory reserve. Auscultate lungs for air movement and abnormal breath sounds. Rationale: Consolidation and lack of air movement on operative side are normal in the pneumonectomy patient; however, the lobectomy patient should demonstrate normal airflow in remaining lobes. Investigate restlessness and changes in mentation or level of consciousness. Rationale: May indicate increased hypoxia or complications such as mediastinal shift in pneumonectomy patient when accompanied by tachypnea, tachycardia, and tracheal deviation. Assess patient response to activity. Encourage rest periods and limit activities to patient tolerance. Rationale: Increased oxygen consumption demand and stress of surgery can result in increased dyspnea and changes in vital signs with activity; however, early mobilization is desired to help prevent pulmonary complications and to obtain and maintain respiratory and circulatory efficiency. Adequate rest balanced with activity can prevent respiratory compromise. Rationale: Fever within the first 24 hr after surgery is frequently due to atelectasis. Temperature elevation within the 5th to 10th postoperative day usually indicates a wound or systemic. Maintain patent airway by positioning, suctioning, use of airway adjuncts. Rationale: Airway obstruction impedes ventilation, impairing gas exchange. Reposition frequently, placing patient in sitting positions and supine to side positions. 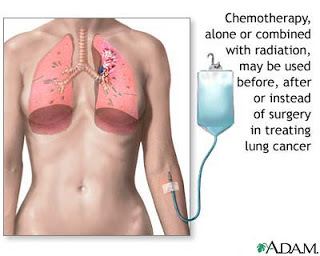 Rationale: Maximizes lung expansion and drainage of secretions. Avoid positioning patient with a pneumonectomy on the operative side; instead, favor the “good lung down” position. Rationale: Research shows that positioning patients following lung surgery with their “good lung down” maximizes oxygenation by using gravity to enhance blood flow to the healthy lung, thus creating the best possible match between ventilation and perfusion. Encourage and assist with deep-breathing exercises and pursed-lip breathing as appropriate. Rationale: Promotes maximal ventilation and oxygenation and reduces or prevents atelectasis. Maintain patency of chest drainage system for lobectomy, segmental or wedge resection patient. Rationale: Drains fluid from pleural cavity to promote re-expansion of remaining lung segments. Note changes in amount or type of chest tube drainage. Rationale: Bloody drainage should decrease in amount and change to a more serous composition as recovery progresses. A sudden increase in amount of bloody drainage or return to frank bleeding suggests thoracic bleeding or hemothorax; sudden cessation suggests blockage of tube, requiring further evaluation and intervention. Observe presence or degree of bubbling in water-seal chamber. Rationale: Air leaks immediately postoperative are not uncommon, especially following lobectomy or segmental resection; however, this should diminish as healing progresses. Prolonged or new leaks require evaluation to identify problems in patient versus the drainage system. Administer supplemental oxygen via nasal cannula, partial rebreathing mask, or high-humidity face mask, as indicated. Rationale: Maximizes available oxygen, especially while ventilation is reduced because of anesthetic, depression, or pain, and during period of compensatory physiological shift of circulation to remaining functional alveolar units. Assist with and encourage use of incentive spirometer. Rationale: Prevents or reduces atelectasis and promotes re-expansion of small airways. Monitor and graph ABGs, pulse oximetry readings. Note hemoglobin (Hb) levels. Rationale: Decreasing Pao2 or increasing Paco2 may indicate need for ventilatory support. Significant blood loss can result in decreased oxygen-carrying capacity, reducing Pao2. Auscultate chest for character of breath sounds and presence of secretions. Rationale: Noisy respirations, rhonchi, and wheezes are indicative of retained secretions and/or airway obstruction. Assist patient and instruct in effective deep breathing and coughing with upright position (sitting) and splinting of incision. Rationale: Upright position favors maximal lung expansion, and splinting improves force of cough effort to mobilize and remove secretions. Splinting may be done by nurse (placing hands anteriorly and posteriorly over chest wall) and by patient (with pillows) as strength improves. Observe amount and character of sputum or aspirated secretions. Investigate changes as indicated. Rationale: Increased amounts of colorless, blood-streaked, or watery secretions are normal initially and should decrease as recovery progresses. Presence of thick or tenacious, bloody, or purulent sputum suggests development of secondary problems (dehydration, pulmonary edema, local hemorrhage, or infection) that require correction and treatment. Suction if cough is weak or breath sounds not cleared by cough effort. Avoid deep endotracheal or nasotracheal suctioning in pneumonectomy patient if possible. Suction the patient as needed, and encourage to begin deep breathing and coughing as soon as possible. Rationale: “Routine” suctioning increases risk of hypoxemia and mucosal damage. Deep tracheal suctioning is generally contraindicated following pneumonectomy to reduce the risk of rupture of the bronchial stump suture line. If suctioning is unavoidable, it should be done gently and only to induce effective coughing. Encourage oral fluid intake (at least 2500 mL/day) within cardiac tolerance. Rationale: Adequate hydration aids in keeping secretions loose or enhances expectoration. Assess for pain or discomfort and medicate on a routine basis and before breathing exercises. Rationale: Encourages patient to move, cough more effectively, and breathe more deeply to prevent respiratory insufficiency. Assist with incentive spirometer, postural drainage and percussion as indicated. Rationale: Improves lung expansion or ventilation and facilitates removal of secretions. Postural drainage may be contraindicated in some patients and in any event must be performed cautiously to prevent respiratory embarrassment and incisional discomfort. Use humidified oxygen and/or ultrasonic nebulizer. Provide additional fluids via IV as indicated. Rationale: Providing maximal hydration helps loosen or liquefy secretions to promote expectoration. Impaired oral intake necessitates IV supplementation to maintain hydration. Administer bronchodilators, expectorants, and/or analgesics as indicated. Rationale: Relieves bronchospasm to improve airflow. Expectorants increase mucus production and liquefy and reduce viscosity of secretions, facilitating removal. Alleviation of chest discomfort promotes cooperation with breathing exercises and enhances effectiveness of respiratory therapies. Ask patient about pain. Determine pain characteristics: continuous, aching, stabbing, burning. Have patient rate intensity on a 0–10 scale. Rationale: Helpful in evaluating cancer-related pain symptoms, which may involve viscera, nerve, or bone tissue. Use of rating scale aids patient in assessing level of pain and provides tool for evaluating effectiveness of analgesics, enhancing patient control of pain. Assess patient’s verbal and nonverbal pain cues. Rationale: Discrepancy between verbal and/or nonverbal cues may provide clues to degree of pain, need for or effectiveness of interventions. Note possible pathophysiological and psychological causes of pain. Rationale: Fear, distress, anxiety, and grief over confirmed diagnosis of cancer can impair ability to cope. In addition, a posterolateral incision is more uncomfortable for patient than an anterolateral incision. The presence of chest tubes can greatly increase discomfort. Evaluate effectiveness of pain control. Encourage sufficient medication to manage pain; change medication or time span as appropriate. Rationale: Pain perception and pain relief are subjective, thus pain management is best left to patient’s discretion. If patient is unable to provide input, the nurse should observe physiological and nonverbal signs of pain and administer medications on a regular basis. Rationale: Fears or concerns can increase muscle tension and lower threshold of pain perception. Provide comfort measures: frequent changes of position, back rubs, support with pillows. Encourage use of relaxation techniques, visualization, guided imagery, and appropriate diversional activities. Rationale: Promotes relaxation and redirects attention. Relieves discomfort and augments therapeutic effects of analgesia. Schedule rest periods, provide quiet environment. Rationale: Decreases fatigue and conserves energy, enhancing coping abilities. Assist with self-care activities, breathing and/or arm exercises, and ambulation. Rationale: Prevents undue fatigue and incisional strain. Encouragement and physical assistance and support may be needed for some time before patient is able or confident enough to perform these activities because of pain or fear of pain. Assist with patient-controlled analgesia (PCA) or analgesia through epidural catheter. Administer intermittent analgesics routinely as indicated, especially 45–60 min before respiratory treatments, deep-breathing or coughing exercises. Rationale: Maintaining a constant drug level avoids cyclic periods of pain, aids in muscle healing, and improves respiratory function and emotional comfort and coping. Demonstrate appropriate range of feelings and appear relaxed/resting appropriately. Evaluate patient/SO level of understanding of diagnosis. Rationale: Patient and SO are hearing and assimilating new information that includes changes in self-image and lifestyle. Understanding perceptions of those involved sets the tone for individualizing care and provides information necessary for choosing appropriate interventions. Acknowledge reality of patient’s fears or concerns and encourage expression of feelings. Rationale: Support may enable patient to begin exploring and dealing with the reality of cancer and its treatment. Patient may need time to identify feelings and even more time to begin to express them. Provide opportunity for questions and answer them honestly. Be sure that patient and care providers have the.same understanding of terms used. Accept, but do not reinforce, patient’s denial of the situation. Rationale: When extreme denial or anxiety is interfering with progress of recovery, the issues facing patient need to be explained and resolutions explored. Note comments or behaviors indicative of beginning acceptance and/or use of effective strategies to deal with situation. Involve patient/SO in care planning. Provide time to prepare for events or treatments. Rationale: May help restore some feeling of control or independence to patient who feels powerless in dealing with diagnosis and treatment. Provide for patient’s physical comfort. Rationale: It is difficult to deal with emotional issues when experiencing extreme or persistent physical discomfort. Verbalize understanding of ramifications of diagnosis, prognosis, possible complications. Discuss diagnosis, current and/or planned therapies, and expected outcomes. Rationale: Provides individually specific information, creating knowledge base for subsequent learning regarding home management. Radiation or chemotherapy may follow surgical intervention, and information is essential to enable the patient or SO to make informed decisions. Reinforce surgeon’s explanation of particular surgical procedure, providing diagram as appropriate. Incorporate this information into discussion about short or long-term recovery expectations. Rationale: Length of rehabilitation and prognosis depend on type of surgical procedure, preoperative physical condition, and duration or degree of complications. Discuss necessity of planning for follow-up care before discharge. Rationale: Follow-up assessment of respiratory status and general health is imperative to assure optimal recovery. Also provides opportunity to readdress concerns/ questions at a less stressful time. Identify signs and symptoms requiring medical evaluations, e.g., changes in appearance of incision, development of respiratory difficulty, fever, increased chest pain, changes in appearance of sputum. Rationale: Early detection and timely intervention may prevent/ minimize complications. Help patient determine activity tolerance and set goals. Rationale: Weakness and fatigue should decrease as lung(s) heals and respiratory function improves during recovery period, especially if cancer was completely removed. If cancer is advanced, it is emotionally helpful for patient to be able to set realistic activity goals to achieve optimal independence. If patient is to undergo surgery, supplement or reinforce the information given by the healthcare team about the disease and the surgical procedure. Rationale: Can help allay anxiety and provides an opportunity to discuss fears or concerns. Explain expected postoperative procedures, such as insertion of an indwelling catheter, use of an endotracheal tube or chest tube, dressing changes, and IV therapy. Rationale: Health teaching is more effective before surgery, when the patient is conscious and aware. Teach patient how to perform deep breathing, coughing, and ROM exercises. Rationale: Helpful in immediately maximizing lung volume after surgery. Evaluate availability or adequacy of support system(s) and necessity for assistance in self-care or home management. Rationale: General weakness and activity limitations may reduce individual’s ability to meet own needs. Recommend alternating rest periods with activity and light tasks with heavy tasks. Stress avoidance of heavy lifting, isometric or strenuous upper body exercise. Reinforce physician’s time limitations about lifting. Rationale: Generalized weakness and fatigue are usual in the early recovery period but should diminish as respiratory function improves and healing progresses. Rest and sleep enhance coping abilities, reduce nervousness (common in this phase),and promote healing. Strenuous use of arms can place undue stress on incision because chest muscles may be weaker than normal for 3–6 months following surgery. Recommend stopping any activity that causes undue fatigue or increased shortness of breath. Rationale: Exhaustion aggravates respiratory insufficiency. Encourage inspection of incisions. Review expectations for healing with patient. Rationale: Healing begins immediately, but complete healing takes time. As healing progresses, incision lines may appear dry, with crusty scabs. Underlying tissue may look bruised and feel tense, warm, and lumpy (resolving hematoma). Instruct patient or SO to watch for and report places in incision that do not heal or reopening of healed incision, any drainage (bloody or purulent), localized area of swelling with redness or increased pain that is hot to touch. Rationale: Signs and symptoms indicating failure to heal, development of complications requiring further medical evaluation or intervention. Suggest wearing soft cotton shirts and loose-fitting clothing, cover or pad portion of incision as indicated, leave incision open to air as much as possible. Rationale: Reduces suture line irritation and pressure from clothing. Leaving incisions open to air promotes healing process and may reduce risk of infection. Shower in warm water, washing incision gently. Avoid tub baths until approved by physician. Rationale: Keeps incision clean, promotes circulation or healing. Climbing out of tub requires use of arms and pectoral muscles, which can put undue stress on incision. Support incision with Steri-Strips as needed when sutures or staples are removed. Rationale: Aids in maintaining approximation of wound edges to promote healing. Provide rationale for arm and shoulder exercises. Have patient/SO demonstrate exercises. Encourage following graded increase in number and/or intensity of routine repetitions. Rationale: Simple arm circles and lifting arms over the head or out to the affected side are initiated on the first or second postoperative day to restore normal range of motion (ROM) of shoulder and to prevent ankylosis of the affected shoulder. Stress importance of avoiding exposure to smoke, air pollution, and contact with individuals with URIs. Rationale: Protects lung(s) from irritation and reduces risk of infection. Review nutritional and/or fluid needs. Suggest increasing protein and use of high-calorie snacks as appropriate. Rationale: Meeting cellular energy requirements and maintaining good circulating volume for tissue perfusion facilitate tissue regeneration or healing process. Identify individually appropriate community resources. Rationale: Agencies such as these offer a broad range of services that can be tailored to provide support and meet individual needs. Airway Clearance, ineffective—increased amount/viscosity of secretions, restricted chest movement/pain, fatigue/weakness. Pain, acute—surgical incision, tissue trauma, disruption of intercostal nerves, presence of distress/anxiety. Self-Care deficit—decreased strength/endurance, presence of pain, intolerance to activity, depression, presence of therapeutic devices, e.g., IV lines.